Shadreck Dube is my name, born in Zimbabwe where I was educated to high school, then went to Nigeria where I obtained a first degree in Zoology and a Masters degree in Parasitology. I Joined National University of Science and Technology (NUST) Bulawayo Zimbabwe academic staff in 1991, was the first chairman of Applied Biology/Biochemistry at NUST and became the second Dean of Faculty of Sciences in 1994. I have supervised 50 honours degree projects, 10 masters and one PhD in total. Twelve of the honours degree projects were in food science and one MPhil. I am currently teaching Applied Biology at NUST. Of the fifty refereed publications to my credit which have been cited 370 times, eleven are in food sciences which have been cited 72 times. I was a contributor in (2001) to “The implementation of a Hazard Analysis and Critical Control Point (HACCP) System”. SAZ 749 2001 Standard Association of Zimbabwe, “Guidelines for the implementation of Occupational Health and Safety Systems”: SAZ 807 2003 and in (2004) “Occupational Health and Safety Systems”:SAZ 18001. I am the current University Senior Proctor and Chairman of the Campus Health and Safety Subcommittee at National University of Science and Technology. I was promoted to Associate Professor in 2010. I have been a reviewer of scientific papers for several journals. I have a bias to study parasites and also have a special interest in traditional African foods. I am currently doing a study of the DNA profiles of Encosternum delegorguei and Imbrasia belina around Zimbabwe. Professor Berinyuy has a PhD from the University of Florida, USA, and a Master’s degree from the Cranfield University, Bedford England and a Bachelor from The University of Ibadan Nigeria. He has been a University lecturer, Department Head and Director for Planning and Development at the University of Dschang, Cameroon. 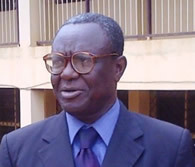 He is currently the Provost of the School of Engineering of the Catholic University of Cameroon (CATUC) Bamenda. Professor Berinyuy has also served as a consultant for the UN and other international organizations as a team leader and team member in several multidisciplinary teams. His research focus has been in the area of improving low income livelihoods through the development of simple affordable post-harvest systems that prolong product shelf life and also the application of renewable energies to solve agricultural problems. He is a reviewer for several journals in agricultural engineering, renewable energy and sustainable development. He has active membership in the Cameroon Society of Engineers, the Nigerian Society of Agricultural Engineers and a past member of the American Society of Agricultural Engineers and the British Society of Agricultural Engineers.